Showing his skills and planting penalties in the top corner, eight-year-old Kasper is clearly a confident footballer. But that has not always been the case. Kasper has hypermobility, hypertonia, dyspraxia, global development delay and a learning disability. This made it a struggle for him to join in with football at school. "He was keen to play in the playground but playing with a bunch of very able-bodied, competitive boys was difficult for him," says Kasper's mum Jo. Jo found out about football sessions run by Hull City's Tigers Trust and took an initially reluctant Kasper along. "For the first few weeks, he just hid behind my skirt and was a little scared and apprehensive about going on the pitch," Jo says. But thanks to the patience and understanding by the Tigers Trust coaches, Kasper quickly developed the courage to get out on the pitch. "Soon he was running on, tackling the big 18-year-olds and loving the game," Jo says. "Week by week, the confidence built in him. "The impact of football on Kasper has been really life-changing and I think he will succeed in life. "He'll be able to go on and have an independent life of his parents, although he might need us in the background a little bit more than his peers. "He will have a home and a job and just do all the things that all his friends are going to do." Kasper is now a regular at the sessions, which are supported by the Premier League/BT Disability Fund. 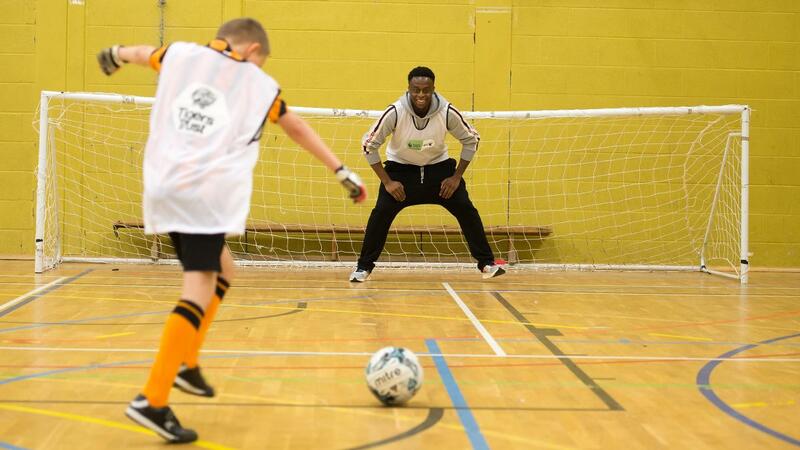 He recently showed how much he has progressed when Hull City defender Moses Odubajo came to watch him in action. And as well as being integrated into mainstream football, Kasper has been put on a disability football talent pathway. "Kasper can do absolutely anything that he wants to do in life," says Adam Newton, the Tigers Trust disability coordinator. "We've given him some ammunition to do that and he's going to take it to whatever step he wants to, we'll continue to support him as long as we can." Kasper is one of more than 19,000 participants to have taken part in the PL/BT Disability programme since it began in 2016.